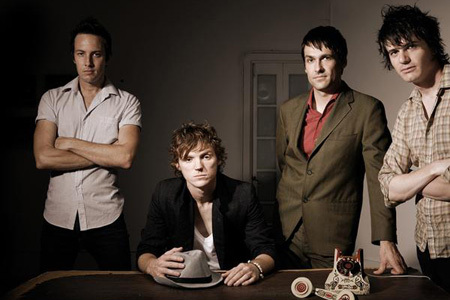 Showing some love for the Aussie bands, “This Heart Attack“ by Faker is a ridiculously catchy single from their latest album, “Be The Twilight” (2007). Similar to the Liverpool boys, “The Wombats”, Faker are bringing back that New Order sound and mashing it with a pop-sensibility that should ensure it’s accessibility to the masses. And the fact that’s catchy as all hell certainly won’t hurt with that. There’s something intense in lead singer Nathan Hudson’s delivery here, yet at the same time apathetic. It’s an intriguing combination, and if you haven’t heard this track yet, click the damn play button below already! Yes very good call with this new track Burgo!